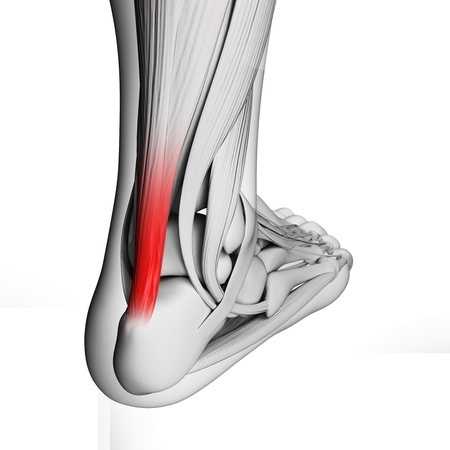 When you feel a severe strain to your Achilles tendon (the large tendon that connects your heel to your calf), you should always stop what you're doing and make a careful evaluation. While straining the tendon may not hobble you, if you continue working out or playing sports you risk tearing or even breaking the tendon which will make you wish you had taken this advice since surgery will now most likely be required. ● Swelling, stiffness, and pain in the heel that radiates up to the calf muscle. ● A minor strain will cause heel pain that gets more pronounced with exercise. This is a signal that you should stop exercising! A severe injury may include a popping sound and you rolling on the floor clutching your foot in agony. ● Resting and icing - Immediately stop activities that make the symptoms worse, and apply ice to reduce swelling and pain. You may need to cease major activity for several weeks. ● Strengthening and stretching exercises - After the initial healing period it will be essential to perform physical therapy exercises to rehabilitate the foot without causing a new injury. ● Custom orthotic inserts - A stiff shoe or boot combined with custom orthotic inserts that raise the heel can help relieve pain and speed healing. Your foot doctor will perform imaging studies to determine the extent of the damage and surgery may be required to repair a tear or break in the tendon. At Fit Feet for Life, our team of board-certified podiatrists has access to advanced technologies and years of experience to help diagnose and treat a variety of foot and ankle problems, including heel pain, sports injuries, toe deformities, nail fungus, and plantar warts. Bonnie Sanchez, DPM, and Gregory Cook, DPM, provide high-quality foot and ankle care to patients in the Tampa/St. Petersburg area at our five offices conveniently located in Sun City Center, Clearwater, St. Petersburg, and our two Tampa locations. Please contact us for more information or to schedule an appointment.